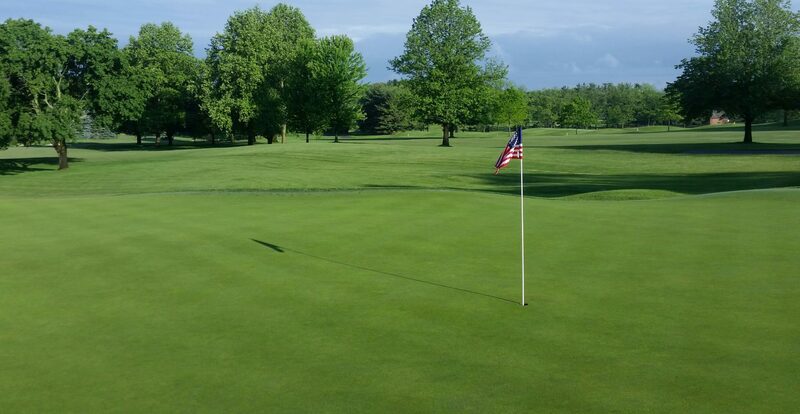 I am happy to say that after a much too long winter, the golf course will be open this Sunday, March 29th at noon. All snow and ice has melted, and the ground has become frost free. But what can you expect to see when you next visit the course? For starters, we will have began mowing playing surfaces, continued clearing leaf litter and other debris from the course, and will start raking bunkers next week. While we do our best to achieve great course conditions from the start of the season, we will be doing these on an “as needed” basis. 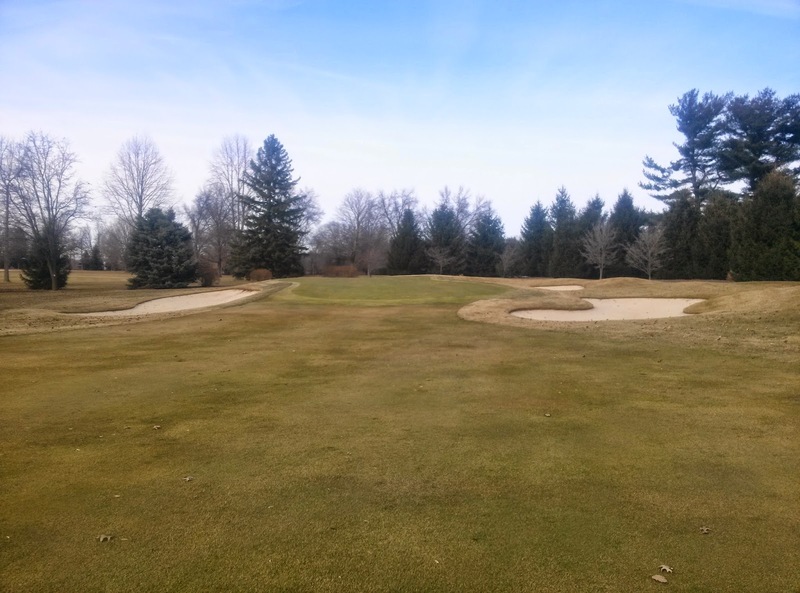 Patience is required for the full quality of Elcona’s golf course to truly shine. A recent USGA article further explains why, which you can read here. 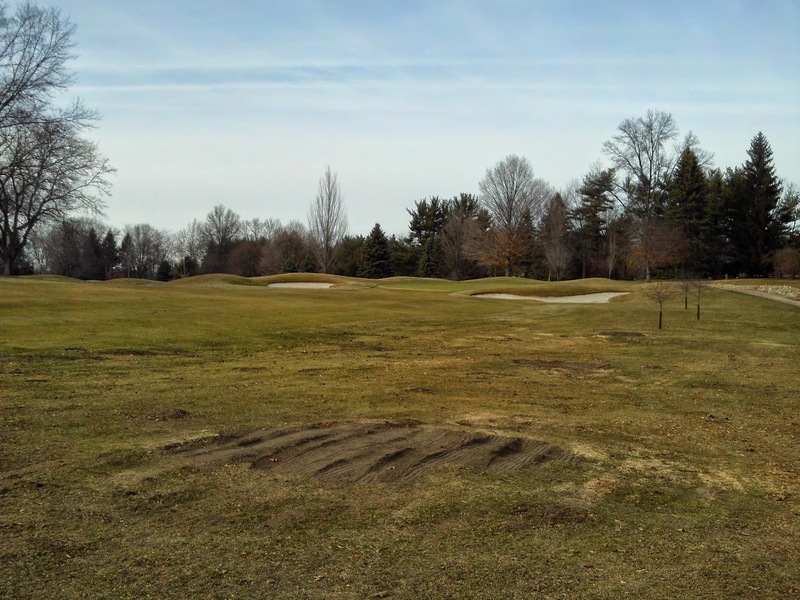 As for other parts of the golf course, you will notice some trees that were removed as part of our annual tree maintenance program. More Ash trees had to be removed due to their demise from the Emerald Ash Borer, others were removed to continuously improve playing conditions. I wrote a more in-depth summary of our tree work you can read here. 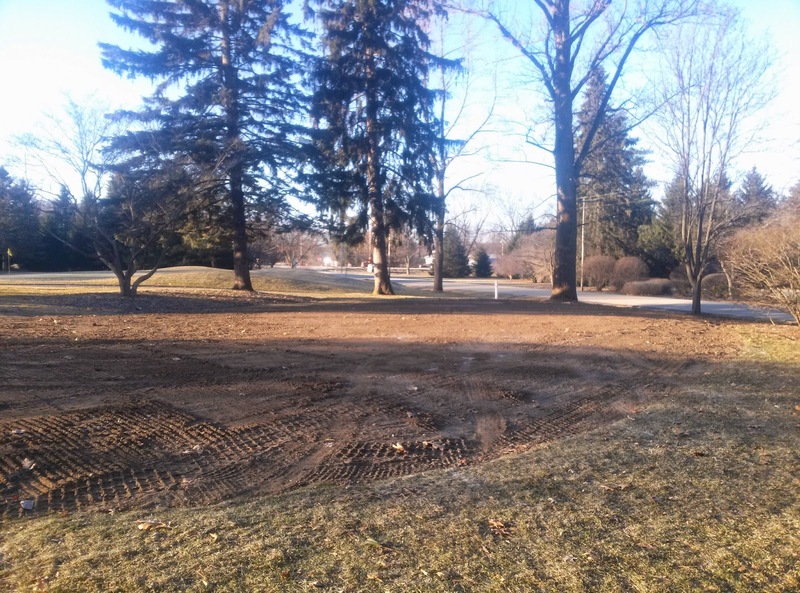 The staff and I have filled and leveled all stump holes with topsoil, and when the weather is more consistently warm, will be seeding or sodding them, depending on their location relative to play. Until then, these areas are to be considered ground under repair. The renovations on 13 and 18 tees are almost complete. We will be bringing in a heavy roller to smooth 13 tee from the settling that occured during the winter, and the staff and I put a finish grade on 18 tee yesterday, which makes it ready for sod and re-alignment next week. I will have a more in-depth post later on. In the next week, the staff and I will be charging the irrigation system, continuing our course and pond clean-up, and continuing on our spring projects. The season is here, we are excited, and I hope to see you on the golf course soon! 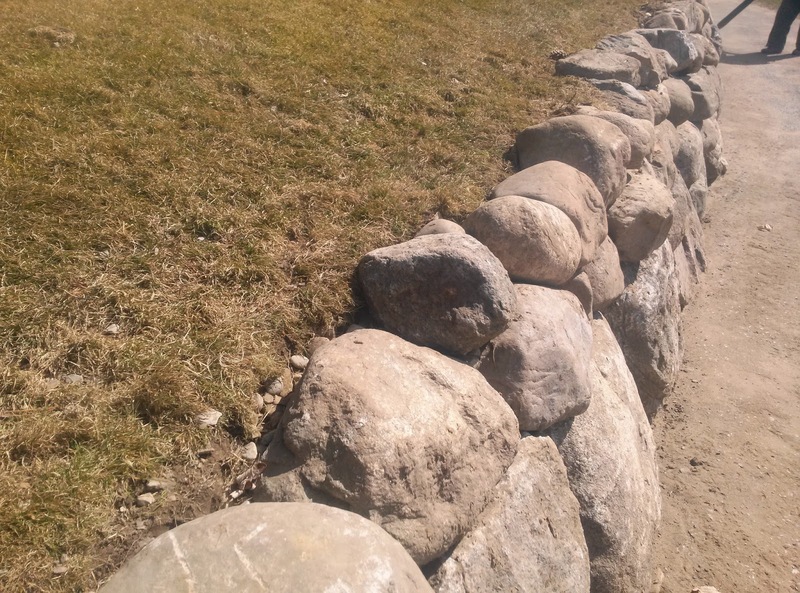 Our contractor laid down a fabric behind the wall to help curb soil erosion and weed growth. 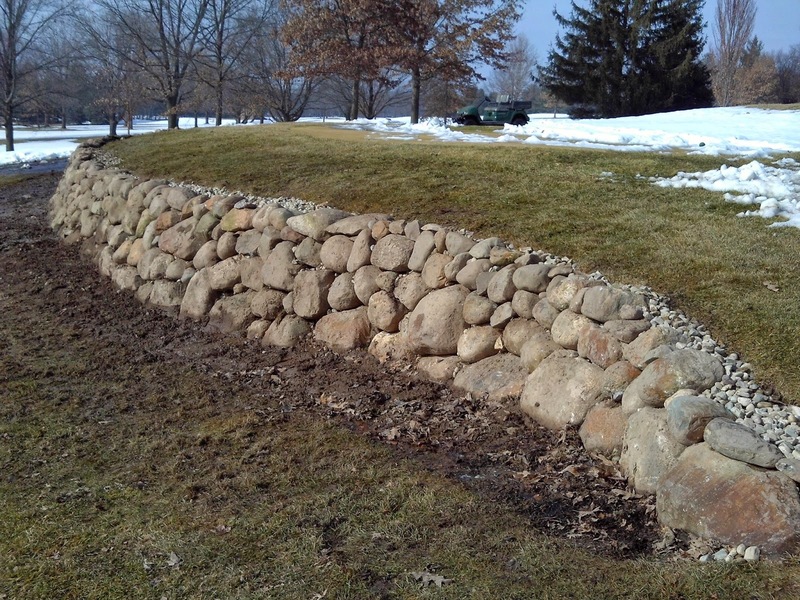 River rock was placed behind the stones to aid in drainage and prevent soil from washing out behind and causing possible wall collapse. While the stone work has been completed, the project is not. 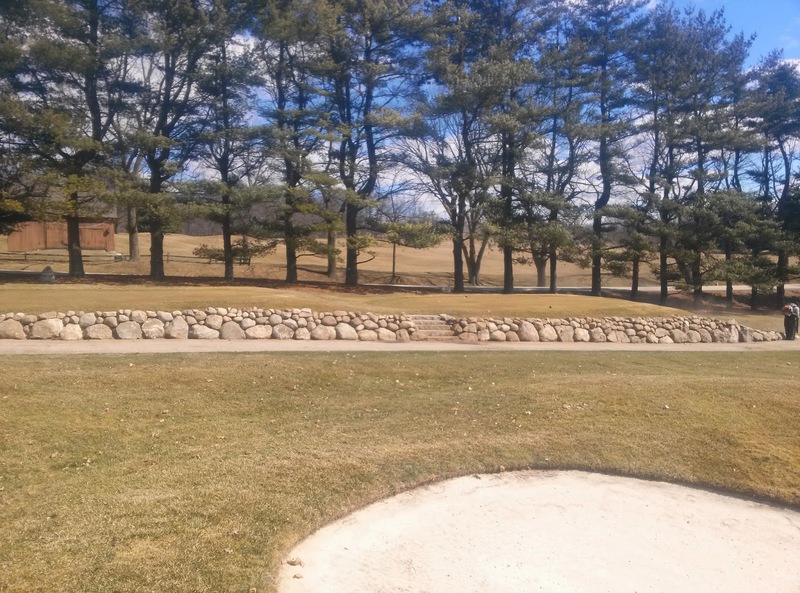 In the coming week, we will be removing a strip of sod and re-contouring the grade from the tee to the rocks on #8, and laying sod to overlap the top course of rock, to further stabilize the top of the wall and make a much smoother transition from tee to wall. 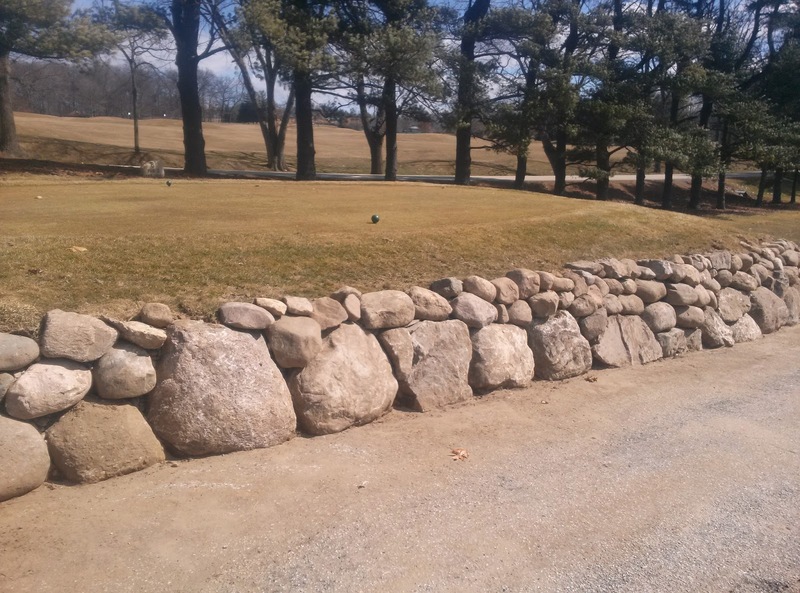 Until we can complete this work, everyone should utilize the stairs or walk onto the tee from the back to prevent any stones from dislodging and causing harm. We will have signs reminding everyone of this. 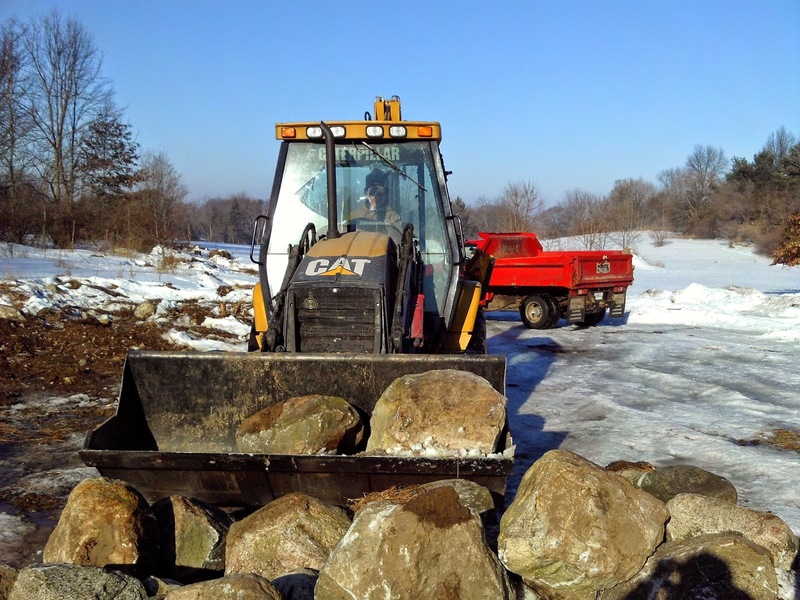 Also, we will be repairing some damage to the older asphalt path as there was a bit of buckling with the weight of materials used and the thawing of the earth beneath. As weather allows, we will be making those repairs. Please watch your path and speed as you traverse to 8 green. 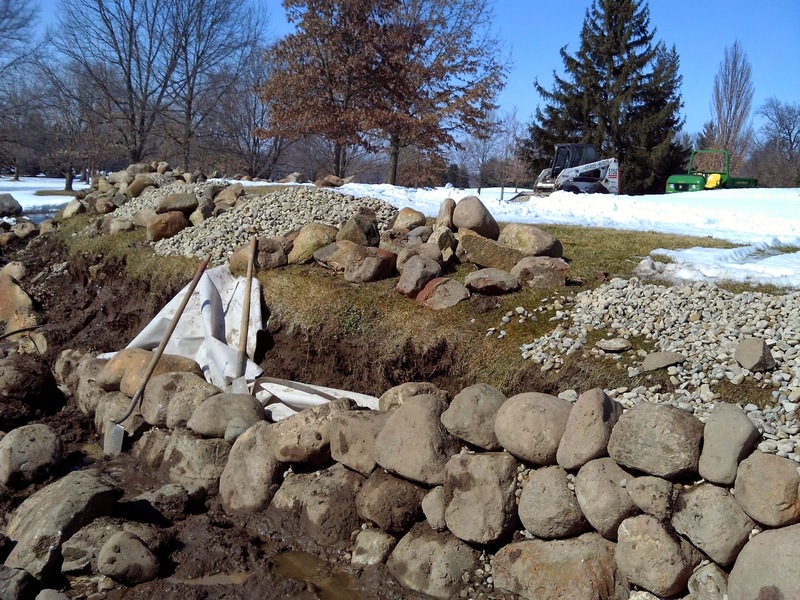 When this project is completed, it will add a dramatic new look to the golf course and provide a longer term solution compared to landscape timbers. I appreciate your understanding while we complete these improvements! I appreciate your patience while the staff and I continue to get conditions where you expect them. There is still some areas of frost in the soil profile, mainly in more wooded areas where there is less sun exposure this time of year (mainly holes 4, 6, 12, and 13). Other areas are too soft for traffic, and a couple greens have not firmed up to the point where they can successfully accept approach shots. Rest assured the golf season is very close! 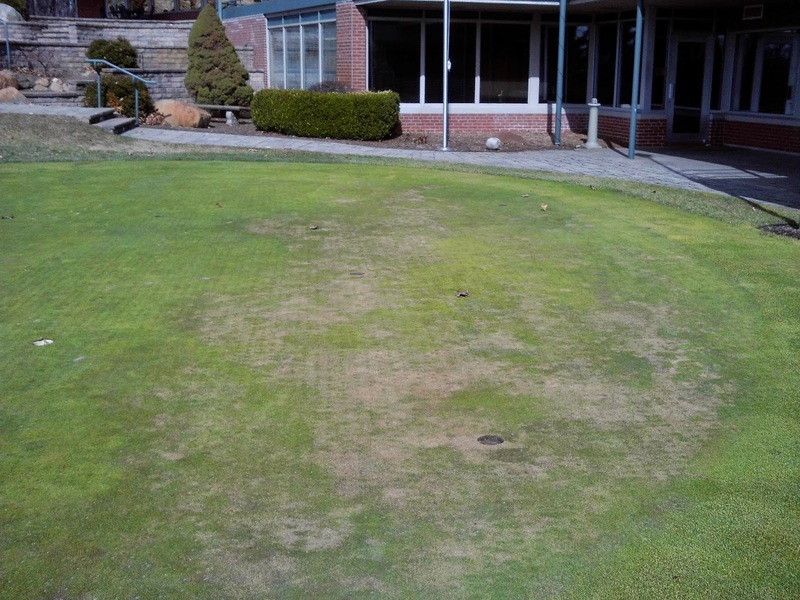 Almost all of our playing surfaces have fared well through the harsh, historic winter we experienced. 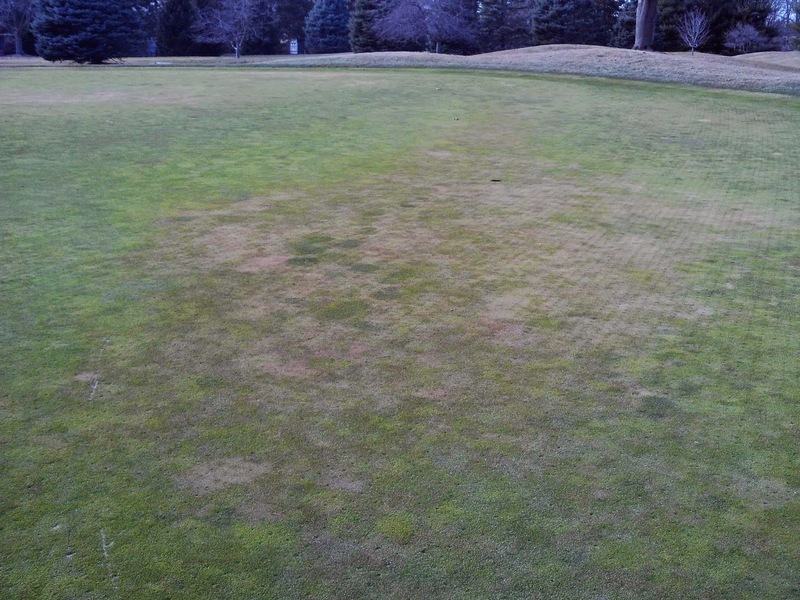 The pictures below depict some crown hydration injury that occurred during the melting period experienced last week. There is a good amount of green leaf tissue deep in the crown area of the green profile, so while it may look brown for a while, I am anticipating these areas to fully recover with more consistent warmer weather. As with some of the winter injury areas we experienced last year, it will take some additional time for these areas to heal. 18 green came out of winter in fantastic shape! Root growth was dramatic and the sod matured well heading into the winter. 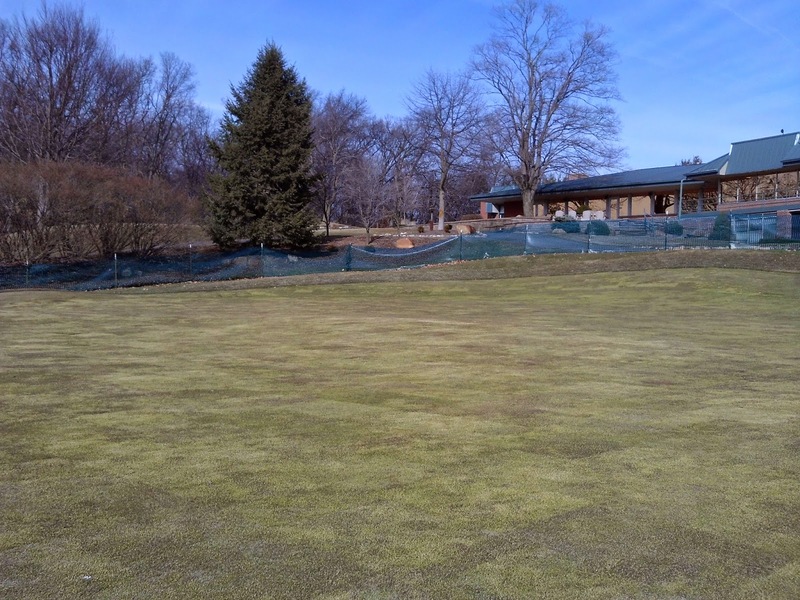 Since we removed and re-used the existing sod to keep the green surface consistent with the others on the course, we will soon begin the process of getting it ready for daily play, which involves multiple topdressings and aerifications to further smooth the surface out. We will also begin mowing the green at a higher height of cut (.225″) and gradually lower it to the same height of cut that all other putting surfaces are mown at (.120″). There will inevitably be some scalped areas that we will have to plug out with our nursery, and there will be lots of rolling as well. Stay tuned to the blog for further updates! The picture on the right depicts one of our busiest spring time projects each year. 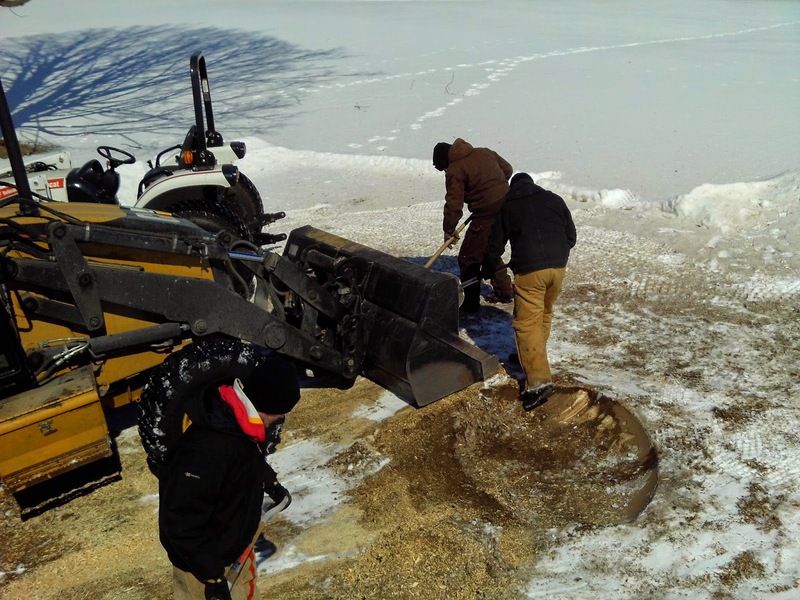 Stump removal and clean up from our annual winter tree work involves cleaning all shavings left behind from the grinder, getting the area matched as close with the surrounding slope as possible, and then filling the hole with topsoil. We will be either seeding or sodding the area depending on their proximity to normal play when warmer weather comes our way. These areas are to be played as ground under repair. I posted a more in-depth post on this process, viewed here. Thanks again for your patience and understanding while the staff and I get the course ready for the upcoming season. In the meantime, come out and enjoy March Madness in the newly renovated bar room and the specials that Chef Casey and Anne have prepared for you. See you out on the course very soon! 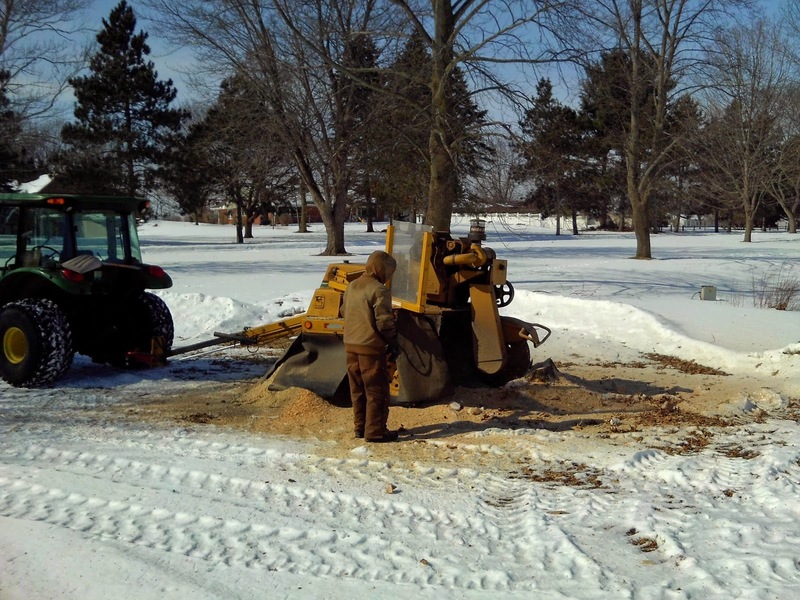 One of our larger jobs in the early spring is grinding all stumps from the winter tree work we performed and prepping those areas for soil, and either sod or seed, depending on their location on the golf course. Above you can see Harold using our grinder on an oak stump along #14. This stump grinder makes fairly quick work of most wood types, except for the hardwoods like locust. The picture to the right shows what is left for the staff to remove once grinding is complete. It is important to remove as much of this vegetative material so that the sod or grass seed that will take its place will grow well. 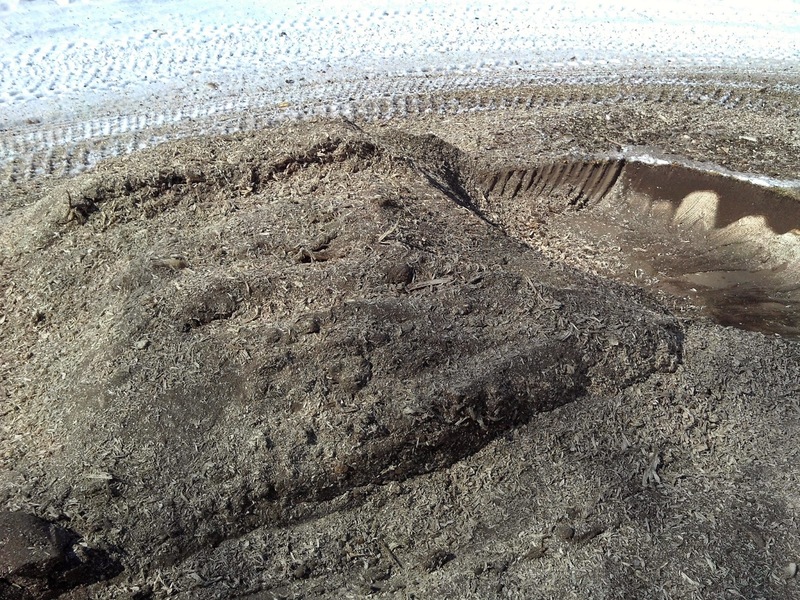 As you can imagine, soil that has a large amount of wood shavings has a much lower nutrient value to turf than topsoil! These grindings and soil are hauled to our compost pile, where they can become useful material again after decomposition. Any chance we get, we utilize the equipment available to make our job more efficient. The pictures below show our removal process. We use two front end loader buckets to sweep the majority of the grindings into the truck. Even though this speeds the clean-up process, there is still a fair amount of hand work to make sure the area is fully prepped for topsoil fill. Our goal is to remove and fill all these holes before activity on the golf course picks up steam, to minimize the impact during play. The season is in sight….. Turf sighting on 7 green! 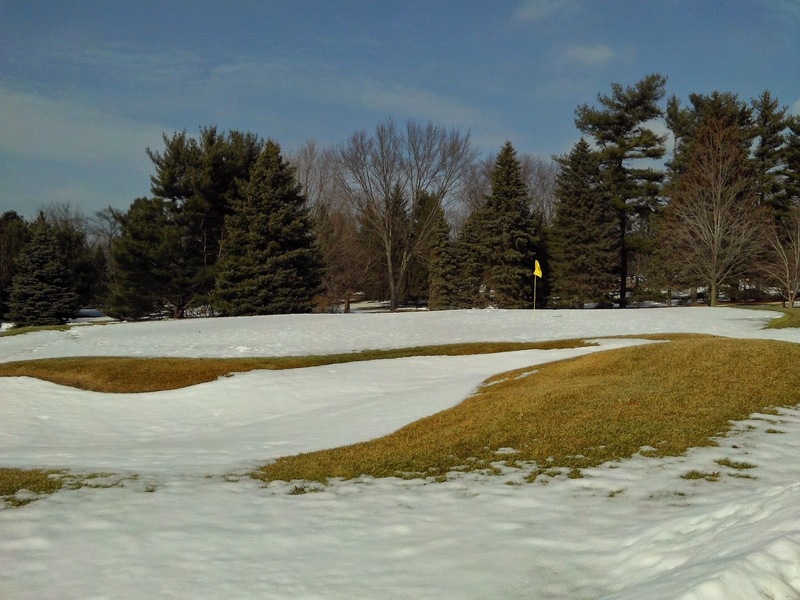 With the bright sunshine and warmer temperatures we have experienced in the last week, the beginning sights of turf and the rapid melting of snow has brought the beginning to the golf season much closer. Over the last few days, much of the snow cover has shrunk in depth. 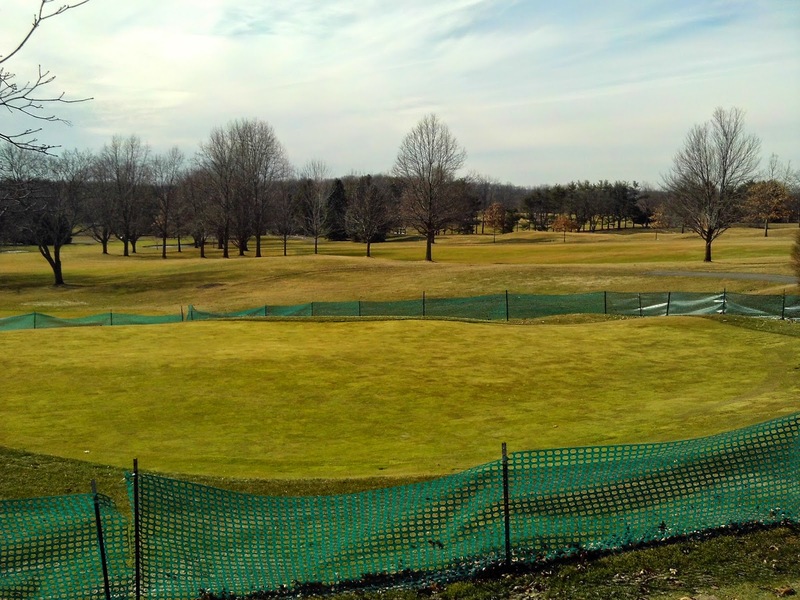 Many of you ask each year when the golf course will be available for play, and I thought I would discuss the two main variables that go into answering that question. The ground must be completely thawed out. This is for two reasons. One, there is no path for melting snow to drain down if the ground is frozen. The water either stands on the surface (or percolates down really slow) or runs off of slopes to any low area. 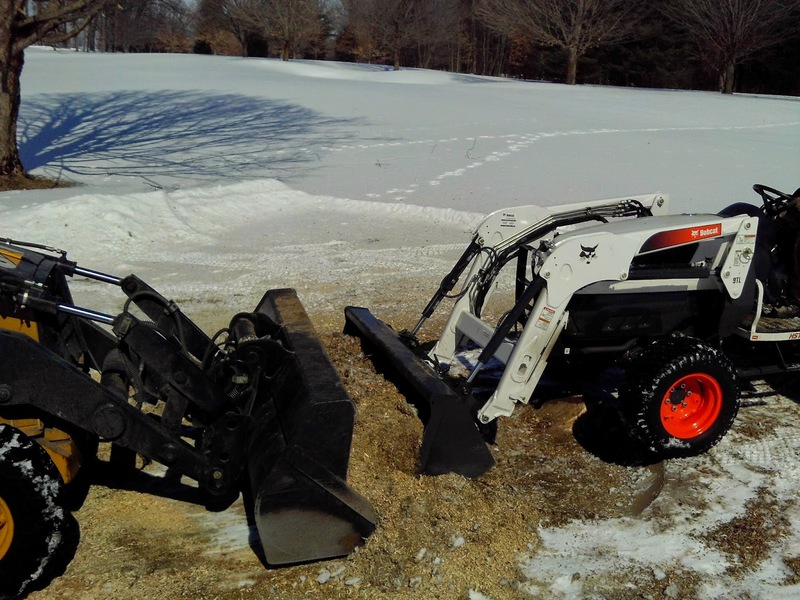 Two, excess machine and foot traffic on frozen ground can lead to root shearing on turf plants, which leads to poor turf quality and a longer window for the turf to green up. The soils are mostly to completely dry and firmed up. This is self explanatory. Wet soils lead to damage from machine traffic and compaction. Playing surfaces also need a period of time to allow proper drainage so we can begin to work them into the firm surfaces you are accustomed to. With the above forecast (as of 3/11/15), the entire snow pack should be gone by the middle of next week. The frost layer is not as deep as last year (9-18″, compared to 36″ last year), which is good! 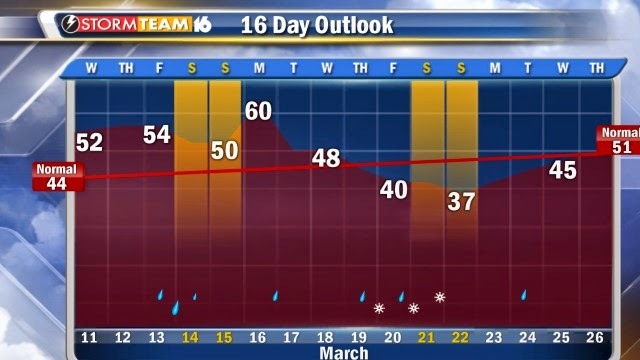 The typical roller coaster forecasts we are accustomed to in Michiana will give ample opportunity for the soil to open up and defrost, but there will also be days where progress will be slower. It seems like the opening will be similar to last year, but as all of you are aware, that can change quickly! I will give ample updates via this blog. Rest assured the season is very close! As a golf course superintendent, I am always interested in the latest and greatest turf research projects that I can apply to my management strategy of the golf course here. If you were not aware, as a member of Elcona, you play a vital role in turf research as well! 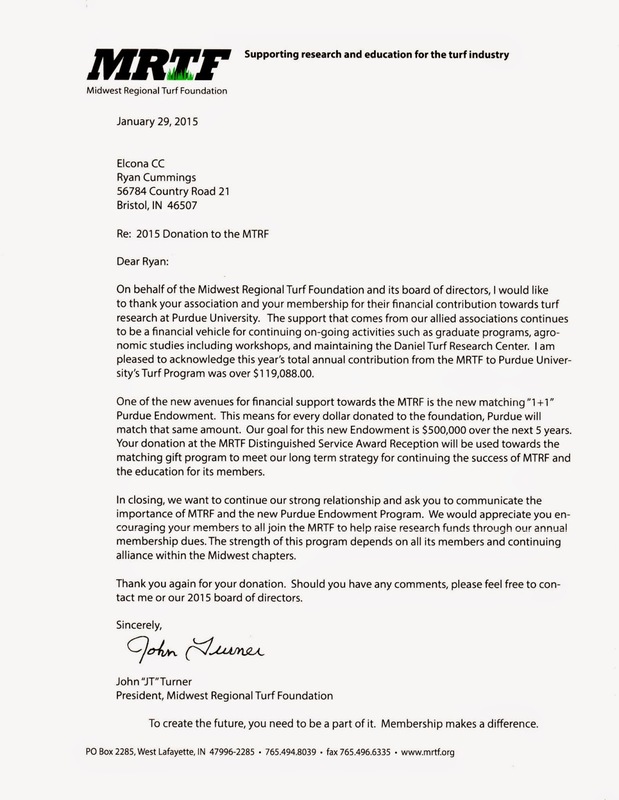 Each year, with approval from the Board of Directors, you are billed an annual donation to both the Evans Scholars Program and the Midwest Regional Turf Foundation (based out of Purdue University). The donation to the MRTF is directly applied to research funding activities both at Purdue and at sites across Indiana, such as Elcona. Past studies include research on pre and post-emergent herbicide control of grassy weeds, preventative applications for certain fungal turf diseases, and white grub control programs. More recently, we have been documenting any benefits of using a compost tea product on fine playing surfaces. Some of the current research projects that are ongoing at Purdue can be viewed here, and if you want any further information on a specific project, please let me know. Greg posted another article on this subject in 2012, demonstrating some of the research that your contributions go toward. I am one that loves to experiment on the golf course and find ways to implement any findings that research demonstrates to better our operation. Thank you for your participation and the role that Elcona plays in supporting turf research. Your contribution does not go unnoticed! 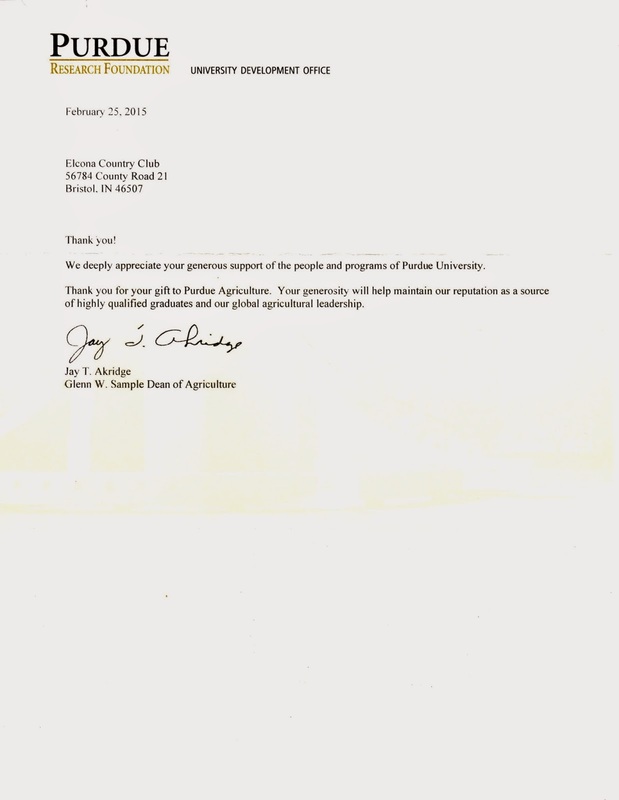 Below are a couple of thank you letters from the MRTF and the Dean of the College of Agriculture, Jay Akridge, that I would like to share with you that echo my sentiments.